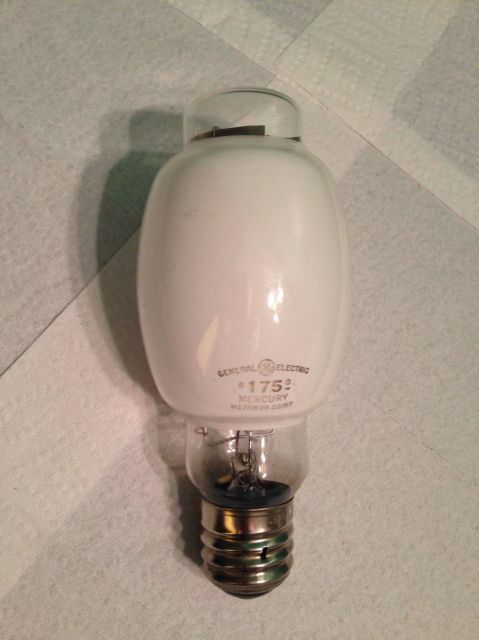 Lighting-Gallery-net - good ol' mercury vapor/GE 175w /W BT28 lamp with side etch!!! GE 175w /W BT28 lamp with side etch!!! This is one of the few BT28 lamps GE made after the switchover to the E28 shape in 1964. GE offered the BT28 shape as an option until 1972 or so. Made exactly like the old Bonusline BT28 lamps except for the base and the placement of the etch. Made in December 1968. Lucky for him I didn't bid on these like I planned. I'm a generous God. Wow, that must be a rare bird!! I was initially gonna bid on the lot solely for the clear Kenny and the cleartop lifeguard but I decided against it. I'm sending Dave the Silverliner some champ lamps for the klear Kenny and some other goodies. Nice find! What color are /W lamps when lit? IMO, the color is close to a 6500k daylight. It'll work out for me and solanacee, as I wanted the GE cleartop and I'm sending the other lamps. O zarlog, it's a 4500K color temp. A bit bluer than /DX white. Wait, you're sending the /c GE, the /DX coated lifeguard, AND the clear Kenny to me? I thought I said that? I'll IM you later and talk about it. Ok. I may have deleted your message, lol. Thank you, Dave. This is a FREAKIN' SWEET LAMP! I had a "preview" of it from Dave a few days ago, and was droolin'! I was also really into that clear Ken-Rad and the GE 250 watt /C, but since Dave got em that's cool Solanacae--awesome score, dude! I would have loved to have these lamps too, but glad you are getting them, but Dave has a bunch of cool stuff for me for a long time now----going back a while, but now that he is finally getting back to working again, maybe he can send it over finally (hint hint, DAVE! ) and I can finally lay my hands on it--but I have stuff for HIM, too! (Dave you have to remind me and refresh my memory on this stuff, too!) I have a Bonus Line BT-28 175/C used but with super low hours from 1963, from the Schagticoke Fair grounds, came out of the NEMA unit is was 'born' in, and was on those grounds since new. The etch is faint but readable, and it is still dirty to this day but on display at The Edison! If you search "mercury vapor" on youtube, you will see a clip of me holding it up, and I tell about it and others. It has AWESOME color, not greened out at all, is BRIGHT, and the arc tube is nearly like new! It was in front of a horse showing barn and I always saw it lit every night across the parking lot when I went home for years---I asked about it, gave them a new lamp, and I ended up with it! Fair maintenance and me go way back and we are great d friends! There is probably more to come--and yes---this is where the RARE 400 watt Line Material/McGraw-Edison "Night Sentry" with a stellar clear lamp inside is, as well as an equally stellar, I THINK 175 watt by the brightness, Joslyn MV-131 "Space Ship" cobrahead with the rare original "square" refractor and another stellar old clear lamp is! These get used 6 days a year, so the lamps are nearly new! Anyway, This side etch GE BT-28 /W is the stuff of DREAMS! OH--and the GE /W had some yttrium vanadats in the phosphor, so yes, bout 4500K, pretty much ditto on the Westinghouse /W "High Output White" lamps, but SYLVANIA uses pretty much only Strontium Orthophosphate in their /W lamps with no yttrium vanadate added, so these are near daylight--like around 5700-5800K versus 5900K for a clear lamp---you have to light one next to a clear to really see any difference at all! I have a couple and they look like daylight when lit, but are NOT 6500k. Cheers! Rick "C-6" Delair! Drool good catch, I thought about it but i as broker then a dog. Wow, that is cool! Also, I didn't know some /W lamps were 4500k! I'd love to see that in person! I have some /Ws with the pure zinc orthophosphate phosphor, they are almost like diffuse coated mercury lamps, but still have a fair amount of color correction. The /W's main purpose was increased efficiency, it is as efficient as /DX but with lower color quality.